Simple roasted vegetables are tossed with orzo, fresh basil and a light and delicious homemade dressing. 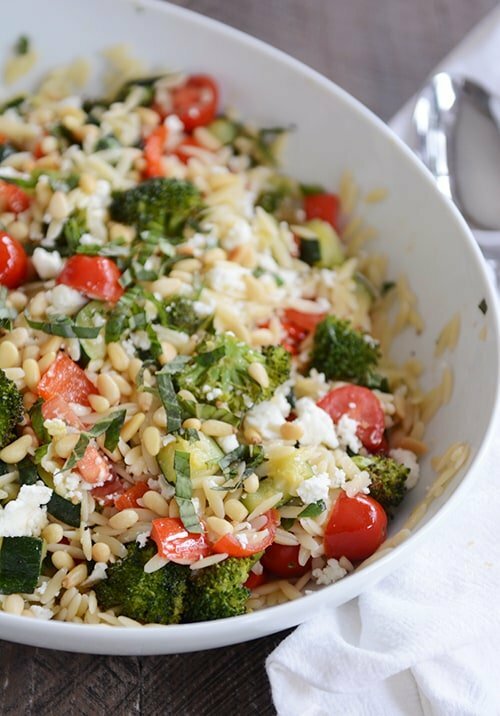 This orzo summer salad is fantastic! 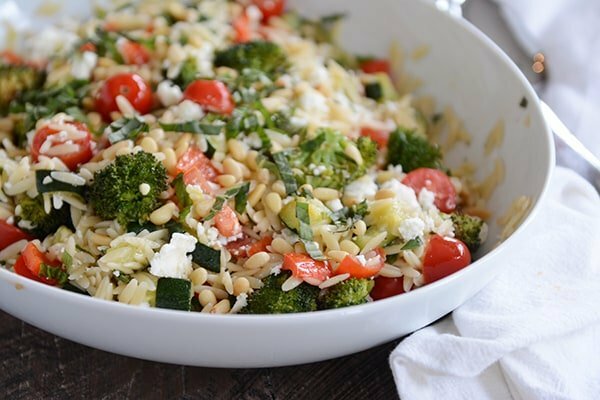 This delightful orzo summer salad is so super amazing, it has easily nudged its way into the lineup of my favorite salads I could eat day in and day out for the rest of forever. I literally just finished setting up my first-ever square foot garden, and the honest reason why I (and by I, I mean Brian) went to all the work of building garden boxes and mixing dirt when gardening is one of my least favorite hobbies is because: fresh basil. Seriously. Fresh basil. I live for it in the summer. And if you’re thinking “dude, Mel, a patio pot could do the job instead of a square foot garden” or “basil is not exotic, you know grocery stores carry that kind of thing,” you clearly don’t know how much fresh basil I go through in a given summer. And now I have an exorbitant amount of garden space dedicated to fresh basil. Fresh basil, may account for 43% of why I love this orzo summer salad. It brightens up the flavor in a way no other herb can really manage and compliments those juicy tomatoes and roasted vegetables perfectly. The other component that has my heart in this dish is the beloved pine nuts. Now before you resist, I totally understand that to afford pine nuts these days is to willingly agree to sell your firstborn child. They are SO expensive which is sad for this pine nut loving gal. I keep a bag of them in my freezer and allocate them very, very carefully – and only for dishes that I know deserve their tiny presence. This salad is worth it. But, if you just can’t go down the pine nut route, I think sunflower seeds or chopped pistachios would be a good place to start for substitutions (and they can also just be eliminated completely, sob). This orzo summer salad screams easy weeknight dinner (serve with grilled chicken or not), summer BBQ and/or potluck, and top notch lunch. It’s so yummy, you guys. I included some variations in the recipe so make sure to read through the notes. Make sure to get some fresh basil planted! You’re going to need it after I get through posting recipes this summer. For the vinaigrette, whisk together the vinegar, lemon juice, sugar or honey, olive oil, salt and pepper until emulsified and well-combined. Set aside (this can be made several days in advance and refrigerated - just whisk together again before using). Toss the vegetables with the olive oil and a couple pinches of salt and pepper. Roast in the oven for 10 minutes; give them a good stir and cook for 10-15 minutes more until tender. While the vegetables cook, bring a pot of lightly salted water to a boil and cook the orzo until al dente. Immediately after cooking and draining, add the orzo to a serving bowl, drizzle on half of the vinaigrette dressing and toss to combine. Scrape the roasted vegetables into the bowl with the orzo and give it a good stir. Add the cherry tomatoes and fresh basil and toss to combine. Add the rest of the vinaigrette and stir until everything is evenly coated. Sprinkle the feta cheese and pine nuts on top. Serve immediately at room temperature. Want a no oven option? Try grilling the vegetables (the broccoli might be tricky, but you could cut the zucchini into spears for the grill and grill the red pepper whole) and then dicing up for the salad. It probably goes without mention, but the vegetable options are endlessly adaptable so go crazy! This salad is best served at room temperature just after it's assembled but I'm not going to lie, the leftovers eaten straight from the fridge (that was all me, my mother-in-law had some warmed up just slightly) are pretty darn good, too. I love pine nuts like crazy but I fully recognize that these days, you might have to sell your firstborn child to afford them. I keep a bag stashed in the freezer for occasional salads like this but feel free to try subbing in sunflower seeds, chopped pistachios, or leave them out. Is this the rice salad that best goes with grilled salmon or do you have other options that would work as well? I was thinking of a lemon infused kind of rice salad but happy for any suggestions you have. Otherwise I will try this salad. Yes, this would be delicious with grilled salmon! Made this for dinner tonight. Grilled the veggies outside on my grill and substituted cauliflower for the broccoli. So, so, so yummy. Perfect summer meal. Favorite side dish everrrr. It is so light and delicious for summer. Leftovers are fabulous as well. Pine nuts, feta, and basil make this dish perfection! This is one of my favorite dishes of yours! and there are a lot. I had forgotten about it until I saw it with the salmon. thanks for the reminder! making both of them this week! My husband and I absolutely went wild over this salad! It’s the most refreshing summer salad ever! I didn’t have orzo so used a cup of rotini. Also I’m not a big feta fan but had a package of shredded 4 cheese medley. Never bought pine nuts before but in this salad they were worth the expense. The only change I would continue to make is to double the dressing as I did this and it made a world of taste difference and was not too much for this salad amount. Awesome! What could I substitute for the Feta Cheese? I made this salad the other day, and it was so fresh and delicious! I ate it for lunch all week without getting bored, which is very uncommon for me. In fact, I plan on making it again tomorrow. I even brought some to share with my co-worker. She also loved it and asked for the recipe. Thanks for this post! Any tips on making this the night before? Plan to double the recipe & take it to a potluck, but not sure I’ll have time to make it immediately in advance. I’d definitely wait and add the cheese and pine nuts right before serving. You might also want to make extra dressing to stir in before you serve so it isn’t dry. This is so good! I actually roasted the tomatoes with the other veggies. Thanks for another great recipe!! This was so delicious! Thank you again for an amazing recipe! Delish! I doubled the recipe for dinner and lunch the next day, and it handled traveling well. Orzo is just so yummy. 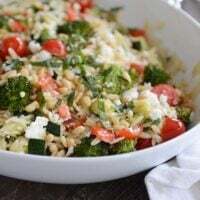 I am also very partial to the amazing Barefoot Contessa’s roasted veggie orzo salad (some similarities with feta, basil, pine nuts, etc. ), but this is a bit simpler. Thanks for a keeper! Just made this for lunch, served with meatballs and a mint-yoghurt-dip. I exchanged the pepper for eggplant because I have a strange toddler who loves eggplant but won’t eat peppers. I was really very nice & loved by the whole family. I love how it tastes of summer somehow! Thank you again for your great, family-friendly but still sophisticated recipes!!! I regularly grill our vegetables because the oven makes the house too hot. A simple trick is too place the veggies on tinfoil and put the tinfoil on the grill. They are much harder to burn and lose in the grates. Works for everything! Sounds delicious, Maryann! I think it seems like a perfect pairing. This was so delicious, and perfect with the bbq chicken I made. Your site is my go to for recipes. Everything is so good! Good question, Sarah, I’d probably reduce the pasta like you mentioned. Maybe 6 ounces? Gluten free orzo is available in my regular grocery stores and on amazon now. 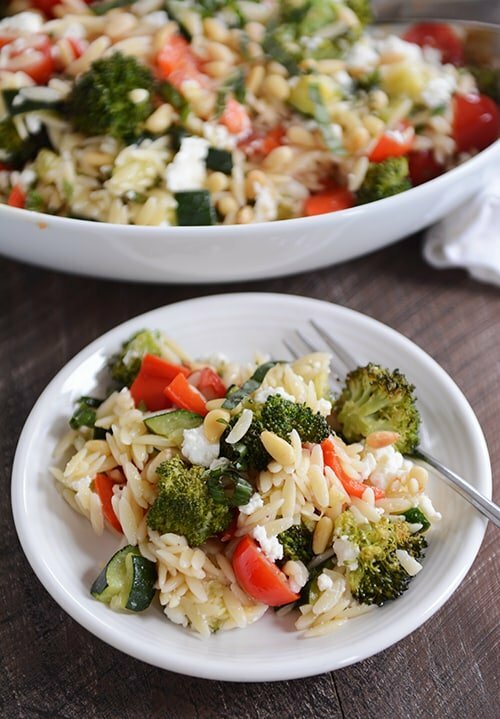 This recipe pushed me out of my comfort zone…I’ve never had orzo, don’t care for pine nuts, kinda iffy about Feta cheese, but the pictures looked so yummy I decided that while at the grocery store this afternoon I’d pick up what I needed to make your recipe. Wow! It is so yummy! My husband and I ate dinner on our back deck and enjoyed every orzo-feta-pine nut filled bite! Thank you so much! We gave it a 10+ which definitely goes on our menu rotation! This recipe pushed me over into buying a basil plant! Can’t wait to give it a try! Thanks, Mel, for all you do! How long do you think leftovers would keep in the fridge for this? I’ve been looking for some healthy lunch options and this looks FANTASTIC! Would love to make a big batch Sunday night to eat throughout the week…but am wondering how many days it would keep for? I’ve eaten this several days out and I think it’s still delicious – it’s obviously a bit drier than when served fresh since the dressing absorbs into the pasta but it’s still very tasty. Yay for square foot gardening! And for lots of basil. I miss the garden boxes I had at my last home. I grew lots of basil and tomatoes every year. You probably already know this, but be sure to regularly pinch back the basil to encourage it to get bigger. No lie, my basil plants usually were 2-3 feet tall by the end of the season because I kept in the habit of pinching them back. Not very familiar with sunflower seeds. Would I want roasted or unroasted, salted or unsalted to use as a substitute for the pine nuts? Would appreciate you telling me the exact kind to buy. Thanks. It seems to be a delicious recipe. For a gluten free meal, I will try to sub the orzo for rice or quinoa. Oooh this is my go to salad for sharing meals in summer – I roast little bite sized squares of aubergine and add in finely chopped capsicum and capers – it is amazing 🙂 Will definitely try with broccoli next time.